The human nose warms, filters and moistens the air drawn in by the lungs and detects air impurities that trigger the sense of smell. The external part of the nasal structure protrudes out through a hole between the cheek bones and consists of two nostrils divided by a barrier called the septum. Behind the exterior part of the nose is a nasal cavity that is lined with mucous membranes and has the olfactory hairs responsible for the sense of smell at the top. Linked to the nasal cavity are four sinus cavities above and below the eyes also lined with mucous membranes. Together these structural elements deliver warm, moist and clean air to the lungs and trigger the sense of smell if any non-air molecules are present in the air flow. The human nose is made up of an external part with two nostrils and the separating septum as well as internal cavities that filter the air. At the top of the main nasal cavity, located above the mouth's palate, are olfactory hairs responsible for the sense of smell. The function of the nose is to detect odors in the air and deliver warm, clean and moist air to the lungs. When the lungs expand and the body takes a breath, air initially enters through the nostrils and passes through the main nasal cavity under the nose bone and above the mouth's palate. This cavity has three protrusions and three passages. The superior concha at the top of the nasal cavity channels air through the superior meatus while below them the middle and inferior conchas guide the air into the middle and inferior meata passages. All three passages reunite at the back of the throat to pass down the trachea to the lungs. All the passages are lined with mucous membranes and fine hairs to trap dust and other foreign particles, including potentially harmful microbes. At the top of the superior meatus, the hairs filtering the air are longer and are responsible for the nasal sense of smell. 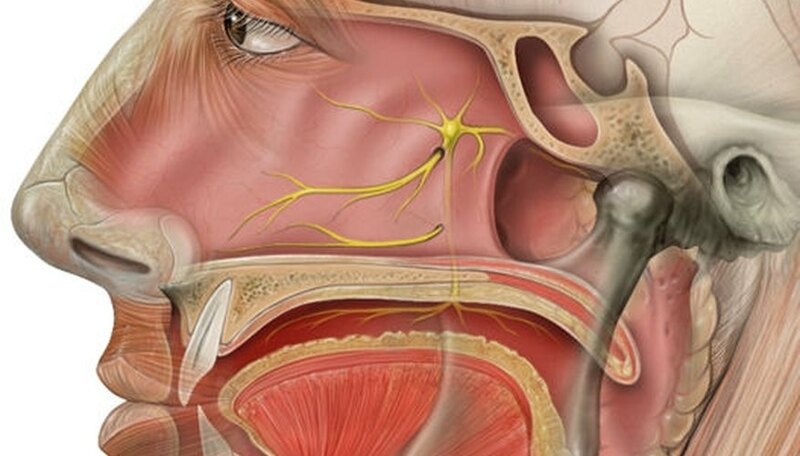 The olfactory bulb is located here, and nerve cells sense the presence of air impurities resulting in signals that the brain interprets as odors. While the sense of smell is often neglected, it is a key warning mechanism for the body to determine whether food has spoiled, whether there is danger from smoke or fire and for monitoring cleanliness. The nose anatomy supports the nose's sense of smell function. The three passages through the main nose cavity share the flow of air, but only the superior meatus has the smell sensing hairs and cells. The air passes through the nasal passages quite quickly and often too fast for detailed smell sensing. Most of the air passes through the two lower passages, but the long hairs of the upper passage slow down the air flow and give the smell sensors more time to function. When a substance that triggers a smell is present in the air, it is absorbed by the mucous lining the walls of the upper passage. Nerve cells are located under the mucous lining and are sensitive to different substances. When a nerve cell is triggered by the presence of substance molecules in the mucous lining, it sends a signal to the brain that the brain interprets as a smell. Most smells are composites, taking the signals of several different cells reacting to different substances and interpreting those signals as a particular odor. For example, the smell of smoke may involve dozens of impurities in the air, but their combination is interpreted as smoke. The smell of sweat has dozens of different components, and the brain has learned to interpret that combination as the smell of sweat. When the nose is working properly, it helps protect the respiratory system and can deliver important sensory signals. These can be warnings about dangerous or unpleasant situations, or they can be positive experiences accompanied by pleasant odors. When the nose is not working the way it should, such as during a cold, the loss of the sense of smell and the reduction of the air filtering and moistening functions serve to emphasize their importance. Why Do the Lungs Feel Spongy? Markgraf, Bert. "How the Human Nose Works." Sciencing, https://sciencing.com/human-nose-works-5477127.html. 24 September 2018. What Are the Chemical Senses?